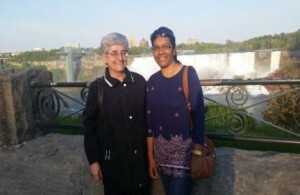 I fulfilled a long-awaited desire when I was invited by Sr. Loretta Manzara, the Executive Director of the Canadian Federation of the Sisters of St. Joseph to visit Canada during the third week of May 2018. The entire visit was well planned and I was accompanied by Sr. Loretta. The visit was short but very fruitful and inspiring to me. I was touched by the zeal of our sisters. There are many places in Canada where the sisters minister, but I only had time to visit London, Hamilton, and Toronto. I had a conversation with Sr. Marie Van Leeuwen, who has been working with refugees for 36 years. She, in a special way, helps the refugees with their residency claims. As per her sharing, there are 11,000 refugees who still have to go through this process. 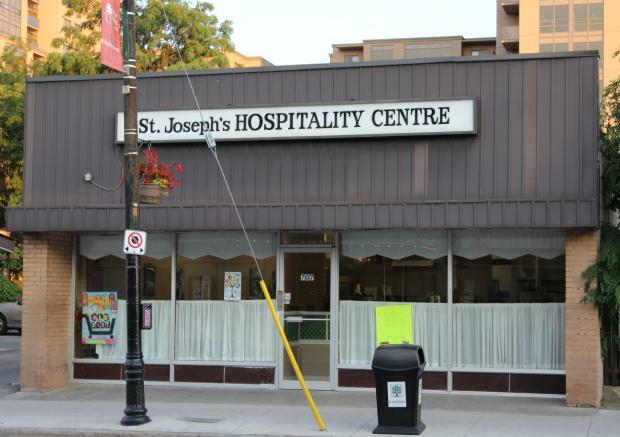 The next person I met was Sr. Marceline Janisse who was instrumental in starting St. Joseph’s Hospitality Center in London, Ontario in 1987. This is a temporary home for newly arrived refugees and is sponsored by the Sisters of St. Joseph. The welcome center has sheltered 1,000 people from different countries around the world. It provides a safe, homelike environment for everyone who goes there. The physical, emotional, psychological, social, economic & legal needs are taken care of for the refugees and refugee-claimants. I had a teleconference call with Sr. Ruth Hennesse, who ministers at Peterborough to refugees in Casa Maria Refugee Home started by the lay group in 1994. Now they have 3 such houses. These homes host refugees from many countries. Today, more than 30 Vietnamese families have come to the home with the help of the volunteers and members. She shared about Syrian refugees and how with other advocates & volunteers, she tries to bridge between the economic and cultural gaps. Mary Shamley’s — an associate with the Sisters of St. Joseph — talk about “Spiritual Ministries Network” was very edifying to me. She began her sharing with a PowerPoint, which included the origin and ongoing thirst of the Sisters of St. Joseph and other members. 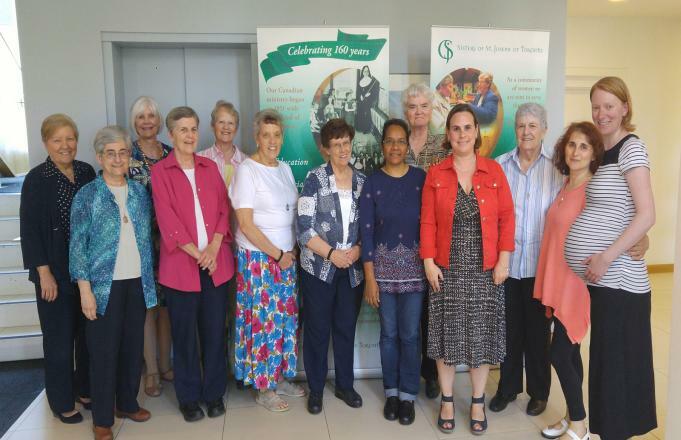 She shared that these groups offer to communicate with others about the CSJ Charism & Spirituality through prayer meetings, retreats, and spiritual exercises at this center. I was happy to meet Sisters Joan Atkinson and Sue Wilson (International Justice Coordinators for the Canadian Federation) during dinner time and discussed their ministries as well. In Hamilton, we visited the refugee and school ministry, Centering Prayer, Women’s Immigrant Center, and Neighbour to Neighbour Food Bank & Resource Centre. I was amazed especially to visit this center which was started in 1986 by Sr. Aloysia Fischer (Gladys). The Centre collects about 87,000 pounds of food in a year. It requires about 60,000 pounds of food each month to meet the demands. The record says that today about 1,100 families are registered for the food bank. It is really wonderful to witness this centre and the management. I had a conversation with Sr. Ann Marshall. She was a wonderful person to listen to. She shared her experience of sharing the effects of “Christian Meditation” with students and staff of the Hamilton-Wentworth Catholic District School Board. It is very successful and she said that it is a great weapon for the tender mind to form. Our final visit was to Fontbonne Ministries of the Sisters of St. Joseph of Toronto which offers diverse programs that are welcoming and inclusive. The historical overview of this was shared by Sister Mechtilde O’Mara and the director of the Fontbonne Centre. This centre provides affordable income based housing for older and single women and different programs known as Mustard Seed (cook, sew, learn about computer & experience hospitality & community), Faith Connections (Encouraging young adults to engage in opportunities that generate spiritual growth & community building), In Good Company (a friendly visiting program responding to individuals seeking emotional, spiritual, and social support), Village Mosaic (offers older adults a welcoming space to come together for hospitality and community building), and Studio on the Hill (to work creatively with clay in a relaxing and friendly manner). The Fontbonne Ministries continues with the Sisters & their mission, reflecting the love of God and neighbor today through the quality of presence that is compassionate & nourishing, hospitality & community support to seniors, spirituality & leadership growth for young adults, respect for each person’s giftedness & creativity, commitment to ecologically sustainable choices, manual support & collaboration, compassion, hospitality & nourishment for body, mind & spirit. The Leadership Team and a few staff members welcomed us to 101 Thorncliffe Park Drive where a meaningful discussion was held over lunch. Lisa Tabachnick, the communication director, screened a video created for Fontbonne Ministries’ titled, “This is Us”. I personally was inspired by the video and with the work of ethics, mandate, structure, and programs of the Sisters of St. Joseph of Toronto. We discussed various initiatives of the congregation which includes the Blue Communities, started Dec. 10, 2017, by the Sisters of St. Joseph and joins the global push to create a Blue planet. By being a part of the global Blue Community, they care about the human right to safe, clean water as explained by Leah Watkiss, program director of the Ministry of Social Justice, Peace, and Care of the Earth for the Canadian Federation. I felt more connected when I heard about SOPAR-Bala Vikasa, a nonprofit ongoing partnership project in India which works for drinking water, capacity building, food security, and environment with women, widows, children, and humanitarian programs. This project has reached 4 million people directly in more than 6,500 villages in 6 states of India (Telangana, Andhra Pradesh, Maharashtra, Karnataka, Tamil Nadu, and Chhattisgarh). It was wonderful to know how our resources are used thousands of miles away to meet the needs of the people.